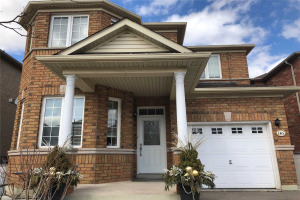 Beautiful Detached 2 Storey Home With Dbl Car Grg. Has A Fin Bsmt & A Sep Ent. Bright Open Concept Design W/ Hdwd Flring On Main Flr, Spacious Great Rm W/ Gas Fireplace. Crown Moulding On Main Flr Large Windows W/ Lots Of Natural Sunlight. Grand Mstr Bdrm, Large Walk-In Closet, Newly Reno'd 5 Pc Ensuite W/ Soaker Tub. Great Income Opportunity W/Fin Bsmt, Sep Ent, Kit, 3-Pc Wshrm, Liv Rm. Newer Furnace, Roof Replaced In 2017, New Grg Dr & Many More Upgrades. All Elfs, All Window Coverings, S.S Fridges (2), Ss Stoves (2), Microwaves (2), Dishwasher, Hood Fans (2), Washer/Dryer.